It’s interesting when you boil things down to their simplest form. Take relationships for example. The BLACK & WHITE simple facts of relationships and how they are formed, besides family, could probably go something like this: People have a common shared interest. People become friends. People do said common interests together to gain experience, enjoyment and fulfillment. This is soundly and perfectly applicable to motorcycles and the people who ride them. WLF is no exception to this basic forming of the relationships that have created and shaped this global community W.E. know today. This is WLF in BLACK & WHITE (& YELLOW). Ultimately, the entire idea of WLF was started long ago when our past generations taught us that being a “grown up” shouldn’t be taken so seriously. Constant journeys to the ocean, lakes, mountains and desert fueled this fun. This generation also taught us that setting out on explorations with family and friends is more fulfilling than doing it alone. In the 1950s, the Smith family homesteaded land in Johnson Valley, California. 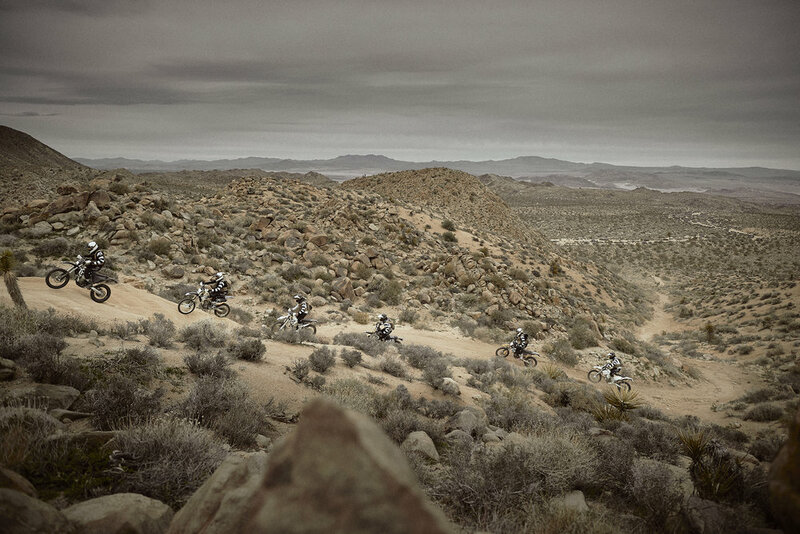 The originals eventually got bikes and trail rode all over JV and the high deserts and mountains of South California. Skirting around the goat trails and up sand washes at what felt like lightning speeds, they formed a bond that has stood the test of time. They were the original WLF founders, even though they didn’t know it at the time. Fast-forward 40 years later, their sons with their friends and families are doing the same thing in the same places and getting the same joy from it, and sharing it with their grandchildren. Funny story: WLF started like most pure things do — by chance. A little over a decade ago, late in the eve around a campfire with a crew of lifelong friends, an idea was sparked. It was simple. We were a pack. It all got started with a sense of urgency for freedom and a bit of the unknown. “See that point on the map, W.E. can get to there from here like this …,” throwing our leg over the kind of bikes that could take us from point A to B, and everything that happened in-between is was what made the memories. Our shared love for the group we have, coupled with the passion for two-wheels, led us to taking on longer rides, more challenges, more snacks and trail amusement. No matter what it was, thick and thin, W.E. always were in it together. The fact is, we rely so heavily on each other that our actual mantra is “FURTHER TOGETHER,” and it’s more than just words on paper. It’s the whole pack’s mentality. WLF’s founding six is one — of brothers, by blood, by marriage and by a shared love of different activities and experiences together over the course of the last 25 years. W.E. have known each other in one form or another for almost all our lives. Growing up in the ’80s, ’90s and ’00s with a love for anything on boards or bikes, everyone tried each other’s favorite pasttime and was forced to flounder and prevail in the ocean, desert, mountain or lake at one time or another. Everyone’s lived through it and gotten a chance to learn, grow together and enjoy every adventure along the way. Brothers Jake and Mike Smith grew up riding dirt from birth and connected with me all the way back in grade school. Chaz Reta came into middle school and onto high school. Chaz Reta came into middle school and on to high school, making sure everyone was in the water at all times. Spending all our free time in the water, building mini-ramps, tearing down mini-ramps, going night boarding on black ice, riding 50cc around the river banks of Blythe chasing down wild horses to film the on Hi-8 because it looked amazing. Luke Takahashi rolled in the crew right out of high school, always surfing and hanging together. After his first ride, Luke was bit by the bug so hard he couldn’t sleep, the singletrack bug, images of endless trails and his friends ripping through them kept him up at night — and still to this day keeps us all motivated to ride. Greg Schlentz lived down the road from everyone, all growing up doing all the same activities and never knowing anyone existed until a happenstance meeting and marrying into the family. This rounded out the original six. Too many stories to remember, so many laughs we can’t count — still to this day, every time we ride any object on land or sea, you’ll see endless smiles. If friendship were traded on the stock market, we’d all be the richest men on Earth. W.E. are a ragtag, blue-collar crew made up of everything from teachers and salespeople to welders, creatives and construction workers that has become a global community of riders connected from around the world. There are so many people that make up this amazing movement, whether you ride with us every week, month or year — or we’ve never even met you — we thank you, you are WLF! W.E. 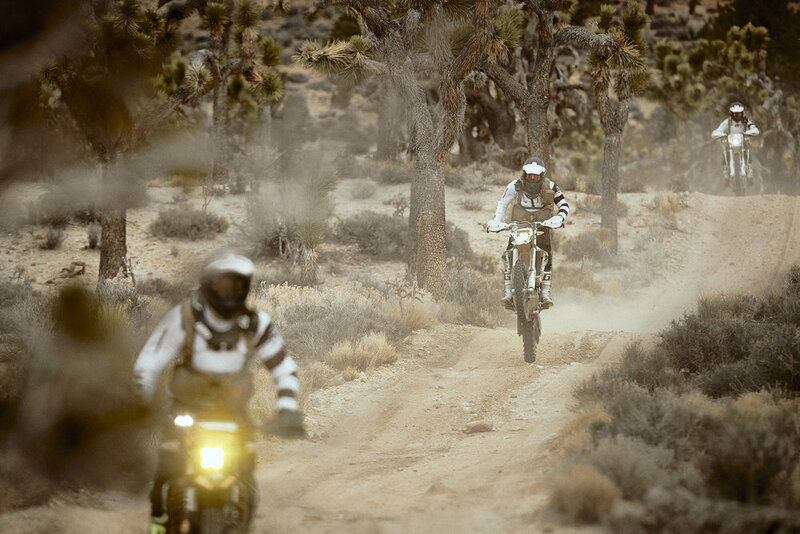 ride trails, mountains, rivers, deserts, rocks, fire roads and anything else you can think of with our friends. Riding in groups doesn’t come without its costs, constantly putting each other in and dragging each other out of tight spots, fixing flats, or getting lost to get found, time and time again. We bring all our own tools to fix our own issues, and others who ride with us can attest that we’d fix theirs in a heartbeat to keep everyone happy and rolling. There’s never a dull moment with the pack. W.E. take our own images of each other, and others that come along with us, and try to spread the love of riding in the best way we know how, through the bliss of motor speed and shutter speed. WLF constantly works to foster community. Creating events, attending and helping friends’ events, supporting charities and participants that are in the two-wheel and off-road community. Creating an annual military appreciation ride event called MISSION, with the premise that every vet should be simply thanked for their service, with a small token of gratitude. This year will be three years running with the support of the team @HusqvarnaMotorcyclesUSA; they bring vets from all over the U.S., from every branch of military, to come out and ride bikes and enjoy a weekend away on WLF and industry brand partners. Proceeds from this event go back to various charities that tie back to the riding community, such as @VeteransBack40. Always striving to give back, W.E. are now seven years in on @RideForKids trail ride, raising funds for Children’s Pediatric Brain Tumor research and foundation. Collectively raising over $15K from our community alone to help fight this disease that plagues thousands of children each year. We love supporting the females in our pack, as well, the #sheWLFs, as we coined them. You can find us out at the @BabesInTheDirt running “dad camp” and trail support for all the amazing ladies that are getting out and pushing themselves and their community. Anya and Ashmore have been a huge influence in empowering the ladies, and we love being able to attend and help contribute. Best thing about our community now is that it’s the WLFamily, no matter what year, make or model you’re on; Dual Sport / ADV / street bikes to technical Off-Road Enduro riding. Our mission is simple: Unifying riders around the globe with a common passion of two wheels and a throttle to go FURTHER TOGETHER. W.E. all start and work together to finish in the same spot and love it every step of the way. Our goals for the future are to provide a platform for the families and the community that make up WLF, keep our focus on the worldwide community moving forward and helping us help people have more enjoyment in life. We want a place where people feel safe to learn and connect and grow as humans and riders. The connectivity of amazing people with each other, working with incredible brands, and helping grow and invest back is something that has given us all such a sense of purpose. Raise our families, be with friends, travel and RIDE MORE. The industry that we love has supported us and continued to show us just what it means to be part of the two-wheel family. W.E. can’t thank them enough for all the support and letting us grow in our own way with our own vision. These brands and the people behind them are all one of a kind and deserve a standing ovation for their commitments to the dreams that all of us have to ride a bike. @FMF73 @DeusCustoms @AnswerOffRoad @SeatConcepts @IMS @BajaDesigns @AHMfactoryServices @GiantLoop @Stance. 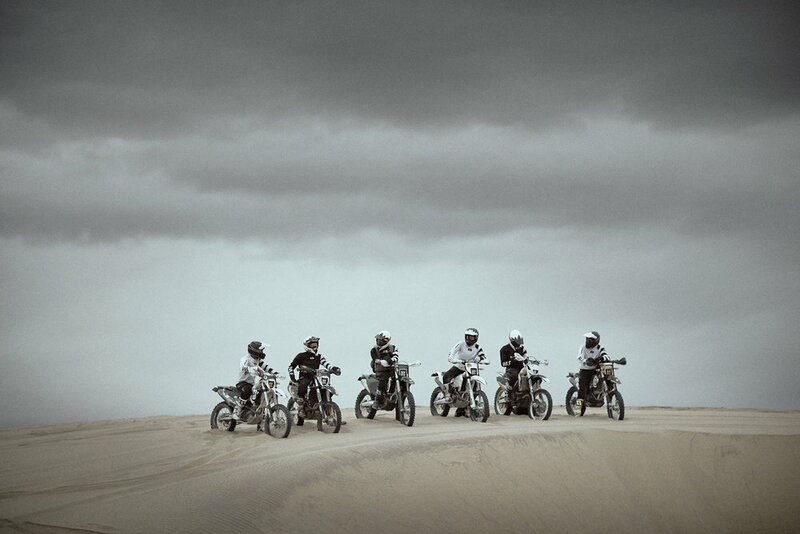 It’s black & white, it’s two-wheels, it’s a throttle, it’s some friends, it’s family, it’s riding. It’s passed on from generation to generation, and everyone gets to enjoy the stoke in their own way. Activities are funny that way — in one way or another, trends and fads come and go, but the root of the thing you do stays the same. Strip it all away, and you still have the people, the relationships and the passion for what brought them together. W.E. started around a fire. It’s evolved into WLF, a global community of riders with a shared passion. Ride with your friends because you love it — simple as BLACK & WHITE (& YELLOW).